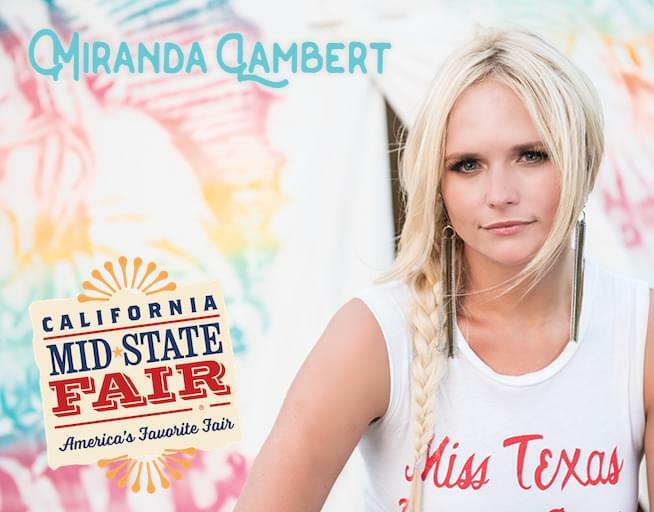 Miranda Lamber comes to the Chumash Grandstand Arena during the California Mid-State Fair in Paso Robles on Wednesday, July 17th at 7:30 PM. Miranda Lambert is the reigning ACM Female Vocalist of the Year, having been bestowed this honor for nine consecutive years. Her accolades include 2 Grammy Awards, 13 (CMA) Country Music Associations Awards, and 32 (ACM) Academy of Country Music Awards as well as many other honors, including the prestigious Harmony Award from the Nashville Symphony. The Texas native released her last record, a double album titled The Weight of These Wings in November 2016, that debuted at No. 1 on the Billboard Country Albums chart. She touts six studio albums to her repertoire; Kerosene (2005), Crazy Ex-Girlfriend (2007), Revolution (2009), Four The Record (2011) and Platinum (2014),the latter earning Lambert a GRAMMY Award for Best Country Album, in addition to her previous GRAMMY win for Best Female Country Vocal Performance in 2010 for“The House That Built Me.” The first song released from The Weight Of These Wings, “Vice,” received multiple Grammy and ACM Award nominations. Lambert’s next single “Tin Man”, which she debuted at the 52nd Academy of Country MusicAwards in 2017 won Song Of The Year at the 53rd Academy of Country Music Awards. Tickets on sale now! Tickets available by calling 1-800-909-FAIR or online at MidStateFair.com, and at 1:00 pm at the California Mid-State Fair box office located at 2198 Riverside Avenue in Paso Robles.